A top Bank of America executive pledged in April that the bank wouldn't "finance military-style firearms for civilian use," but the bank is still lending $43 million to gunmaker Remington Outdoor Company. Bank of America (BAC) has been working with Remington since it filed for bankruptcy in March, contributing to a $193 million loan package, along with six other banks. Last week, a bankruptcy court judge approved the gunmaker's plan to exit bankruptcy before the end of this month. 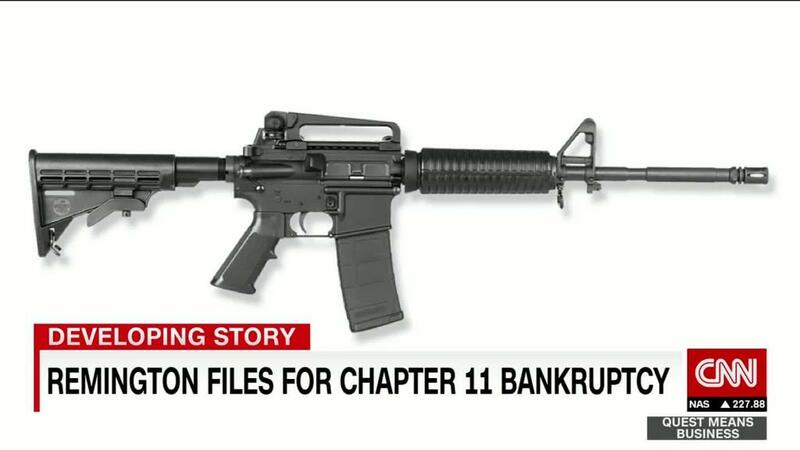 Bank of America agreed to make the loan before vice chairman Anne Finucane told Bloomberg in April about a new company policy to stop funding the AR-15-style semiautomatic rifles made by Remington and other companies. Remington made the Bushmaster rifle that was used in a 2012 mass shooting that killed 26 children and educators at an elementary school in Newtown, Connecticut. "This was a commitment that predated the comments in April, and because of the complexities of the bankruptcy, it's a commitment that we're keeping," said a source at Bank of America. The source said that the bank will see the Chapter 11 process through to completion. "We look forward to learning how Bank of America will influence Remington to change its ways to keep Americans safer," said Avery Gardiner, co-president of the Brady Campaign to Prevent Gun Violence. "We'll certainly be watching." Some banks and Wall Street firms have backed away from doing business with the gun industry since the shooting at a high school in Parkland, Florida, in February, when an AR-15 Smith & Wesson rifle made by American Outdoor Brands was used to kill 17 students and educators. Citigroup (C)has said it would bar companies that it does business with from selling guns to people under the age of 21, and require customers to undergo background checks for all gun purchases. Money manager BlackRock, (BLK) the largest shareholder in gunmakers Sturm Ruger (RGR) and American Outdoor Brands (AOBC), has started offering clients the option of investing in funds that exclude firearms and retailers that sell them. State Street (STT), a top shareholder in Sturm Ruger, American Outdoor Brands and Vista Outdoor (VSTO), said it's contacted those companies to learn how they "will support the safe and responsible use of their products." Private equity firm Blackstone (BX) said it asked a dozen outside hedge fund managers about their stakes in gun manufacturers and distributors. Vista Outdoor said last week that it's "potentially" selling off its gun brands. But Wells Fargo (WFC)is bucking the trend, announcing last month that it plans to keep lending to gun manufacturers.